Top Ten Mac & Cheese Combo's! This entry was posted in Food Inspiration and tagged Dinner Ideas, Good Food, SMAC, Macaroni, Mac & Cheese on February 27, 2015 by admin. Macaroni Cheese is the ultimate comfort food! We are an office of food lovers here at Forever Bespoke HQ, so much so that we went to our local SMAC meeting this week – that's the Scottish Macaroni Appreciation Club – at Sloans Pub in Glasgow. It's described as “an evening for people who love mac and cheese” and it certainly lived up to it. First up was Sloans Legendary Mac – a classic mac & cheese. Sometimes, the classics are the best. We all loved this one as it was the perfect amount of creamy and cheesy. Spinach and Ricotta Mac also featured – this one wasn't as creamy as all the rest, but the ricotta complemented it brilliantly. With the spinach on top, you could convince yourself that it's definitely healthy and reasonable to eat if you're on a diet. Beef Lasagne Mac – the lasagne mac was the winner of the night, meaning you'll be able to buy it in the pub for the next month. It's exactly what you image it to be, lasagne sheets replaced with cheesy mac. It's like two dinners in one! Finally, there was the Mystery Mac, which was Mushroom and Black Truffle Oil Mac – the mystery mac isn't revealed until the end of the night, with everyone guessing what it's going to be. The mushroom and truffle oil concluded this months Italian theme. This one had a good strong flavour to it and got good reviews from all the staff! Pulled pork is everywhere right now, so why not try it on top of some mac & cheese? Cook them separately and then put the pulled pork on top of your macaroni on the plate. Add a little bit of BBQ sauce on the top for some extra flavour! The macaroni pie is a Scottish classic. Made out of shortcrust pastry, filled with macaroni cheese and left with an open top – it's a quick and easy way to get your mac fix on the go. Smoky chorizo will spice up any dish and is the perfect compliment to your cheesy pasta. Combine it with some chicken or bacon to add even more flavours to your meal. Macaroni and pizza, two of the best comfort foods around. But what happens if you merge them in to one dish? Cook your mac & cheese, then put it on top of a plain pizza base. Sprinkle some more cheese on top and then bake it in the oven – there's no need for any pizza sauce, the mac will be creamy enough on its own. This is another two-meals-into-one recipe, adding a kick to your mac! This can all be cooked in the one pot (this is always a bonus) and should be filling enough that you won't need to cook rice or any other sides to go with it. Put in plenty of beans, spices and cheese to make it full of flavour! There are two different versions of a macaroni burger, and it's up to you to choose your favourite! The first one involves making your macaroni cheese in to a burger shape, and having it with salad in the burger bun. The second version is topping a beef burger with mac & cheese. Be warned, this meal can get a bit messy when you're trying to eat it! A healthier take on the classic mac! Make your macaroni cheese and a separate avocado sauce (you might want to add some garlic and herbs to this) and mix it all together just before serving. This will give you a lovely creamy dish, which will also be a brilliant shade of green. At the other end of the health scale, we've found out that there is such a thing as fried mac & cheese balls. This will be one to try if you're a fan of fried mozzarella sticks and have plenty of time on your hands. The recipe for these does have a few stages, including cooling down your macaroni, shaping it and freezing it before frying. For the best results, you'll want to do the prep work for these the day before you plan on eating them. A cheese filled twist on your normal mac recipe – just add in your favourite blue cheeses to your sauce in place of some of the cheddar. You might also want to sprinkle some over the top of your cooked mac to get a more intense flavour out of it. Our final recipe to try was featured at the SMAC event in January. It sounds like a bit of an odd combo, but the sweetness of the candied bacon and waffle sat perfectly with the savoury mac & cheese. It's an adventurous recipe, but well worth trying out! Have your waffle broken up and mixed through the mac so that you get a good mix of sweet and savoury...if you're brave enough! 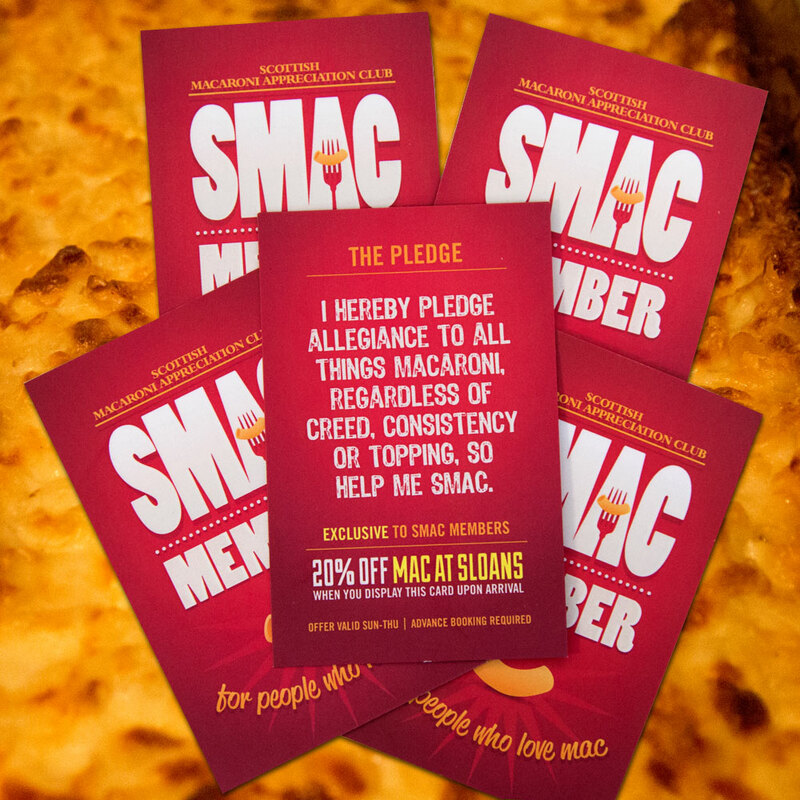 If you are a fellow Mac Addict check out the SMAC facebook for regular Macaroni Updates! This entry was posted in Baby Inspiration, Children Inspiration, Lifestyle Tips and tagged raising kids, children on February 24, 2015 by admin. Every new parent knows exactly how they're going to raise their child...until they're born and the whole plan gets ruined. Here are our top 10 things you said you'd never do, but you did! 1. Keep them in pyjamas all day – This is guaranteed to be the first rule to be broken. When you've got a tiny, wriggly newborn baby, the last thing you want to do is wrestle a pair of trousers on and off them 10 times a day. And let's face it, babies look super cute in sleepsuits. All the time. 2. Bribe them – We've all been there, looking at the toddler with a big packet of sweets, thinking “I'll never do that when I have children”. But you will. When your little angel is bored in town after 5 minutes and just won't stop moaning, that packet of sweets may well save your day and your sanity. Anything to stop a toddler screaming is worth doing. 3. Let your child sleep in your bed – My child was always going to sleep in his own cot, in his own room, right? Wrong. If letting him into my bed at 4am when he wakes up gets me a little bit more sleep, I'm going to take it. 4. Put photos on social media...constantly - We all know how annoying it is pre-child, seeing non-stop baby photos on Facebook. And we all swear that we won't be joining in...but your kid is just so cute. You just can't help yourself sharing all the cute faces when they're tiny and the selfies once they get big enough to do it themselves. 5. Be late because of the baby – The baby will just fit right in with your life, so no need to worry about being late or missing out on things. Until your realise that it's actually you that fits in with the baby. You're already running late because the baby needed changed, fed, changed again and you've still not packed the changing bag with the one million things your baby might need while you're out. 6. Buy loud, plastic toys – Every new parent goes through the phase of only wanting organic wooden toys, but once your child gets a bit older, you'll find out that they need more than that. Children are drawn to bright plastic, preferably with a loud repetitive song that plays when they press a button. 7. Stick them in front of the TV – Use the TV as a babysitter?! You'd never do that! Until it's 5pm and the kids just won't leave you alone to make dinner. Enjoy the peace as they're engrossed in cbeebies for 5 (or 25) minutes. 8. Feed them junk food – Because as they get bigger, you'll realise that a happy meal once in a while won't actually do any damage. And it saves you washing any dishes when you get home. 9. Walk away from their tantrum – There's a toddler lying in the middle of a shop floor, with the parent nowhere to be seen. What you don't know, is that they are hiding at the end of the aisle (still watching their toddler) and that you'll be doing it one day too. Children like to fall to the floor as if the world is ending when they're not allowed something, and it works to just walk away. Give them a minute to realise you're gone and they'll pick themselves up, stop crying, and start following you again. 10. Use the pram once they've turned 2 – In an ideal world, as soon as your kid can walk, you'll ditch the pram. But toddlers walk very slow, unless they're running away from you. For a quick dash to town, letting them go in the pram will make life that little bit easier for yourself! This entry was posted in Inspirational Guides on February 22, 2015 by admin. Keep on running...10 ways to prepare for a Marathon! If you are running a marathon and worried about the task ahead, we've got it covered. This helpful guide will provide you with the basics to kick start your marathon preparation and hopefully make it (a little!) easier. 1. Dress the part - Investing in the right gear can make all the difference to your performance. Treat your feet to a good pair of running shoes (or two!) by visiting a local sports store for specialist advice on the best pair for you. Ensure that they are lightweight but still provide enough support. Why not splash out on colourful tank tops or patterned leggings to brighten up your run and help keep you motivated. 2. Work your way up - Combining running and walking is a great way to ease your body into the routine and minimise the chance of injury. It is important not to overdo it, especially if you are just starting out. 3. Mimic the route – If possible, try and find out what type of surface you will be running on. For example, if the course is an area with lots of hills you will need to prepare for this by running somewhere similar or altering the incline on the treadmill. 4. Update your play list - Research has shown that listening to high tempo music whilst running increases motivation and overall performance. So when the going gets tough, stick on your favourite songs and keep running. Pharrell – Happy, is our favourite up beat song! 5. Be realistic - Setting realistic goals can increase your confidence and allow your body to adjust to your new routine. If you are a beginner then don't expect that you'll be able to do a 10k straight away! 6. Keep hydrated - It is important to replace loss fluids. Try to take a bottle of water or a sports drink with you to keep hydrated on the go. If you don't want to carry fluids, ensure that you take regular breaks. 7. Maintain a healthy diet - Eating right is key to maintaining stamina whilst running. Stock up on carbohydrate-rich foods, such as pasta, potatoes, bread, and fruit to ensure that your body has enough energy. 8. Train with others - Why not join a running club or train with friends to create a more social experience. You can catch up on gossip while you run to keep your mind occupied and share motivation. 9. Play games - Take your mind off running by focusing on the song you are listening to, tell yourself you will run until the end of a play list or sing along in your head. By focusing on something else you will surprise yourself with how many miles you've covered when you next check. 10. Recover! It is important to ensure that you have sufficient rest days so that you avoid injuring yourself. And get plenty of sleep..rest your weary head on your very own personalised Eat Sleep Run Repeat Pillowcase! Whether it was for a sense of achievement or to improve your fitness levels, motivation is key and it is important to remember why you started. Follow this advice and hopefully you will cross the finish line with a smile on your face! If you're looking for more inspiration check out Carly Rowena's blog for some great advice! This entry was posted in Bride To Be Inspiration, Love and Romance and tagged wedding stationary, photography, bride & groom, diy, colour schemes, 2015 weddings, Wedding trends on February 17, 2015 by admin. Wedding season is almost here, with the plans for Spring weddings truly underway and the wedding fairs starting for those planning for the later months. With so many elements to decide on, we've picked out our favourite trends of the year. You'll recognize some that have carried over from last year and spot some new trends that are just emerging. One of the big flower trends for 2015 is having the look of freshly picked flowers for your bouquets and arrangements. This rustic, relaxed look usually involves a variety of flowers that will compliment each other and the season. Picking some that will definitely be in season and choosing a local florist can help to keep your costs down. Your arrangements can also be complimented with other seasonal elements, like acorns and pine cones in autumn, and red berries in winter. The tiered cake is making a comeback! Wedding cakes are changing to be suited to the bride and groom's taste, with more couples choosing adventurous flavours in place of the classic fruit cake. Try having a selection of flavours over the different layers, or even having a 'naked' cake – that's a wedding cake without any icing on it. With all that cake to be eaten, it can be doubled up as the dessert after your wedding dinner. Eating at weddings is becoming less formal and some couples are opting out of a sit down meal, in favour of food being available all night. If you want to create a relaxed, party-like atmosphere, a food truck might be the missing detail you're looking for! From hot dogs and chips to cupcakes and sweets, any tastes can be catered for. If you decide to go for a food truck, make sure you have enough of them to avoid any long queues for your guests. Dramatic, bright, and bold ones. Invitations are being steered towards a floral trend this year and they're going to be something that stands out. With strong colours on your invitations, no-one will be able to pass over any of the important details. Beautiful calligraphy surrounded by illustrative flowers is the go-to look, with postcard invitations being a popular choice. These invites are a great modern twist on vintage paintings and are sure to fit in with any wedding. Grooms are getting more involved in wedding planning and now it's time for them to stand out against the crowd too. A quirky look is a less conventional choice, but has a bit more fun in it! Stylish suits can now be found in tweed patterned material – they'll still have the classy tweed look about them, but the groom won't get too hot. Another stand out trend is the blue suit, which can be made even more bold by using yellow accessories such as his tie, socks or shoes. Wedding photographers and videographers are now offering more ambitious viewpoints of your special day. Using drones to fly their equipment in to the air, you can capture the day from a birds eye view. This could give you great photographs of your reception and guests, by getting everyone in without the hassle of posing for the camera! This type of photography would be ideal for an outdoor wedding, to show off the beautiful landscape and area that you've chosen. If a veil isn't quite your thing, bridal headbands can make the same impact and be worn through both your ceremony and reception. There are headbands to cater for any style of bride – from glamorous crystals to laid back flowers and everything in between. Headbands compliment any hairstyle, up or down, and are sure to be on your accessory list for the day. Light coloured dresses for the bridesmaids, teamed up with a bright bouquet are on trend this year. Natural and powder colours are very popular, alongside reds and pinks. If you're wanting your bridesmaids to look a bit different from each other, the same dress in various light colours can be a fantastic way to do this. You can even incorporate your colour scheme in to an ombre wedding cake, or the bride's dress if you're feeling brave! Wedding DIY is one of those things that can elevate an event and can help the bride and groom to save money to spend on their honeymoon. We've collected some ideas that can make your wedding day even more unique like incorporating a chalk board table plan, wooden signs for directions, home made sweet favours, hand made stationary and why not set up your own photo booths with a vintage style camera and props. Rustic themed décor can create a personal and intimate atmosphere at your wedding. Copper replaces silver and gold this year, adding a bit more warmth to the colour scheme. Natural decorations and centrepieces tie in perfectly with it, contributing to a relaxed look. Wooden tables and chairs without any coverings on them will fit right in, and will look beautiful topped with wooden table decorations. Our heart table decorations are laser engraved with the couples surname and wedding date, and now is your chance to win 100 of them for your own wedding! Click the image below to ENTER! This entry was posted in Family Life and tagged Take Pets Away, Family Holiday, Summer, UK Breaks, Holiday on February 13, 2015 by admin. It can be hard to imagine the beautiful mountains, pristine lakes and warm beaches when you're looking out the office window, but they are there! The UK has some of the most breathtaking scenery that people travel from all over the world to see. It can feel like a world away when you travel to the Scottish Highlands, the Lake District or visit the beaches in Devon. Why go anywhere else when you've got it all at home? When you cut out the cost of flights, new passports and converting your currency, you'll be in for a big saving. This extra money could allow you to go on holiday more often than before and to have more spending money for days out. If you can swap flights for an extra week's holiday, it might be worth making the switch. Even if you've lived in the UK for your whole life, chances are you've not seen half of it. You know all about the popular holiday destinations in Britain for tourists, but have you actually been to any of them? There's a reason that tourists visit them, so why not find out for yourself by taking a holiday there too. With all that and more going on, holidays can get stressful. Before getting away, you have to worry about getting there! Cut the stress out of your holiday by traveling closer to home. A few hours in a car can be much more appealing than a long haul flight, especially if children are involved. Traveling at your own pace gives you the opportunity to stop along the way – for food, a quick stop at an attraction, or just to let the kids burn off some energy. When you don't change time zones, you don't get jet lagged! Jet lag can easily knock a few days off your holiday as you recover, not forgetting the time that you've spent traveling. Staying in the UK will give you a few more days to just relax, with no worries about readjusting back to your normal routine. The Weather in the UK is something that we all like a good moan about, but we can't deny that it does get quite nice in the summer. These sunny days make our beaches down south rival those in France and Spain, and are the perfect times to get out exploring the countryside. Another plus about our weather is that we're used to it. This can be especially useful when you're on holiday with children, as they'll be able to cope with the heat and be at less risk of sun stroke. Sometimes it can be too hot on holiday, leaving you inside during the hottest times of the day and getting irritable when you're trying to sleep. Stick to what you know, but you'll still need to pack some sunscreen! There is a lot to do in the UK. If you choose to stay here, there is a massive selection of what kind of holiday you want. There are beautiful beaches on our coastlines, busy city breaks, adventure holidays and countryside getaways. There really is something to suit everyone and plenty of choice that will accommodate your needs. From five star hotels to small camping sites, we've got it all. If you've only got a few days off, a short break nearby could be just what you need. A quick drive or train journey will leave you with enough time to relax and get in to holiday mode. The short journey home also gives you a full last day – no need to leave early in the morning to make sure you're home at a decent time. With a diverse range of food all over the UK, why not try some of the local cuisine? Look for local restaurants and pubs to sample the local food and drinks. You might discover a new favourite amongst them! There is a fantastic selection of restaurants all over the country, from small family run pubs to Michelin star restaurants. Go somewhere different and new, to make the most of being in a different part of the country. Having your own transport can give you more options when you're on holiday – from where to go on days out to how much luggage you take with you. Driving to your destination means that you're only restricted by the size of your boot! And there's always a way to squeeze more stuff in. Again this can be more useful if you have children or pets, meaning that you can take their bikes and toys for when you're having a more relaxed day. Don't forget to pack the essentials if you are traveling with your dog.. This entry was posted in Love and Romance and tagged top tips, pillowcases, valentines day, Love on February 10, 2015 by admin. It can be the most romantic day of the year, or something that you'd rather pass on...so we've come up with the top 10 things to do on Valentine's Day with something to suit everyone. Whether you're planning a date night or a night out with your friends, there's going to be at least one idea to make your Valentine's Day a good one! 1: Have a movie night – This one is great for everyone. If you're in a relationship then swap the long queues at the cinema, and expensive popcorn, for a cosy movie night at home. If you're single, invite your friends round to your house for a night in. You get to pick the movie, eat whatever you want, and there won't be anyone tall sitting in front of you...perfect! 2: Eat a lot of chocolate – It would be rude not to eat the box of chocolates that you've been given. Better make sure it doesn't go to waste and eat them all at once. 3: Make gift tokens for your other half – Flowers and chocolate might be a classic on Valentine's Day, but they're also predictable. Why not give something with a bit more of a personal touch? Make gift tokens for your partner and it'll be the gift that keeps on giving. Let them cash in their tokens for various gifts like days out, breakfast in bed and a night off from cleaning the dishes. 4: Cook a romantic meal at home – Save yourself the stress of booking a table at a busy restaurant and make a romantic meal in the comfort of your own home. A candlelit dinner doesn't have to be fancy to impress – cook your partner's favourite food and it'll go down a treat. Why not take them upstairs afterwards to surprise them...with a Valentine's pillow to go to “sleep” on! 5: Go out with the girls – If a quiet night in isn't quite your style, a night out with cocktails might sound more appealing! Get the girls together and go for a night out in town...who said Valentine's Day is just for couples anyway?! 6: Send a Valentine's card signed from a “secret admirer” - Even if they'll know it's from you. Keep the day fun and light hearted with a mysterious card through the door! Everyone likes to get a card on Valentine's Day. Although they won't always admit it, you can guarantee they'll be smiling once it's opened. 7: Treat yourself – Because you're the best person to love, all year round. Show yourself just how much you're appreciated by getting you a treat. Get those expensive shoes you've been eyeing up, or that top that you've wanted for ages...you deserve it! 8: Buy her some flowers – Sometimes the classic gifts are the best, especially if you're not usually one for buying flowers. Your wife will appreciate the romantic gesture, and will be thinking of you all week when she looks at them. 9: Go back to your first date – Remind your partner of where it all started and take them back to your first date. It'll bring back fun memories and will make for a much more meaningful date, if it's somewhere that means a lot to you both. 10: ...nothing – Why not wait until the 15th to buy loads of chocolate half price and go out for dinner when it's not so busy! Don't get stressed about trying to do the most romantic thing on Valentine's Day, when you can show your other half just how much you care on any other day of the year. This entry was posted in Lifestyle Tips and tagged weather, active, winter, outdoors, Forever Bespoke on February 6, 2015 by admin. When the cold weather hits and your warm bed is persuading you to have just five more minutes, the prospect of heading outside can seem unappealing. If you are searching for a winter workout that will motivate you, here are some great ideas to get you active and stick to that new year resolution to shed a few pounds! For families, kids and pets that love the great outdoors, this is a perfect way to get active. There is nothing better than crunching through crisp leaves when it's frosty so grab your winter boots, puffy jacket and explore Britain's beautiful woodlands, trails, beaches and parks. The fresh air will feel great and your post-festive body will thank you for it! If walking isn't strenuous enough then why not step it up a gear and try hiking. Scope out local mountains or climbing sites to plan your route. Hiking is a great way to spot some wildlife, and experience a part of nature you wouldn’t otherwise get a chance to see. If you are feeling adventurous why not take a tent and set up camp when you find the perfect spot. Layer up and get on your bike for a fantastic full body workout that will improve overall heath and well-being. Opting for a bike ride gives you the opportunity to enjoy the winter scenery and cut down on harmful emissions – both good for you and the environment! There are lots of different outdoor clubs you can join – try a local walking club or perhaps a boot camp if you are feeling brave! In addition to being physically active it is a great way to meet people and make new friends! Search your local council website for information on exciting clubs in your area. If you are looking for a more hands on approach to getting active outdoors then why not volunteer to help out on local projects such as tending the community garden - a great way to burn both stress and calories (much more appealing than the gym!). Getting friends and family involved can make getting active much more fun and provides an opportunity for some bonding time (if you are not too sick of them after the festive period!). Plan team activities such as snowball fights, ice skating, football or rounders. Learning a winter sport such as skiing, snowboarding or ice skating is definitely an option for those who have a real sense of adventure! Stay stylish with our outdoor Boing bracelets which are fashioned from sailing and climbing rope. With a variety of colours and sizes, they are the perfect accessory to accompany you on your great adventure! Definitely not for the faint hearted - activities such as white water rafting, canoeing and windsurfing can certainly be a refreshing activity! Children will love playing with the outdoor toys they were given at Christmas so get involved - running around after them will definitely burn some calories! With the thick snow fall a game of hide and seek will also be great fun to play... no matter what age you are! It is cold, disruptive and a complete nuisance at times but it can be lots of fun! make the most of the snow by going sledging down a big hill or build a snowman (tip - try to get the kids involved so it doesn't look as strange to the neighbours). So what are you waiting for, wrap up in your winter gear, get outdoors and get active! This entry was posted in Family Life and tagged packed lunch, naps, family, children, babies, nursery, childcare, Forever Bespoke on February 3, 2015 by admin. Finding childcare for the first time can be a daunting task, whether your baby is 9 months or 3 years old. With a lot of things to consider and questions to ask, we've come up with a checklist of 10 things to be looking out for during your selection. 1: Meal Plans – Find out if you have to make a packed lunch to take in, or if food is included in the price. If it is included, what kind of meals do they make? A hot, 'home made' lunch is a popular option in nurseries, which means less worry about dinner when you get home. Don't forget to ask about catering for any special dietary needs that your child has. 2: Naps – Are there set nap times, and where do they sleep? This could be a big thing to consider. If your baby will only nap with a cuddle/walk in the pram/dark room, you need to make sure that they can get it. 3: Holidays – You might be jetting off on a week away, or just taking some time off work and want to take your child out of childcare for the week. Make sure you know the policies on holidays. Some places still take full fees for being off, others are a bit more relaxed. You don't want to get an unexpected bill when you get home from holiday! 4: Cuddles – Sometimes a cuddle can solve anything. From a teething baby to an upset toddler, a cuddle can make it all better. You want somewhere that can be a home from home, and where the staff have time for all the children. 5: Potty Training – It might be a long way off, but one day you'll have to do it! Find out how often they'll go to the toilet and how many spare pairs of pants you should pack. Maybe put in some spare socks and shoes too. 6: Activities – Have a look at what toys are on offer for the children and the different things that they can do during the day. It's good to have a mix of activities, so that they can go wild in the morning and relax towards the end of the day. An outdoor play area is always a plus, and ask if they'll go on trips to the shops and park. 7: Settling in Sessions – These can be just as important for Mum and Dad as they are for the child. Check out how many settling in sessions you can do, starting with an hour or two before you build up to a full day. Most nurseries and childminders will be happy for you to phone up and check on how your child's doing at any time, which could give you the extra peace of mind that they're having a good time! 8: Who Can Do Pick Ups? - There might be an emergency at home, a meeting running late or your train has been delayed, so you need someone else to do the evening pick up. Make sure you have a back-up plan in case you can't get there in time, and that your childcare provider knows who this is. They might want to meet them, or have a password to give before they can collect your child. 9: Accessibility – You may have found the perfect place to send your child, but it won't work if you can't get there! It can also help if you're dropping off your child en route to work, so you're not adding too much time on to the start and end of your day. 10: What do you need to pack? - Find out everything that's included in the daily rate you'll be paying. You might need to send in your own wipes, nappies and a packed lunch. Ask about trips and any toddler groups your child might be taken to, and if these are funded out of what you already pay. Remember that the most important part of childcare is that you and your child are both happy. They might take a little while to settle in, but soon enough your child will be running away from you the second you're in the door. Don't forget to pack a change of clothes (maybe more than one...) and to put their name on the tags!